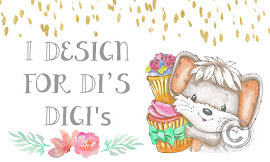 Voor deze challenge heb ik de afbeelding Tasty cupcake van Di's digi stamps gebruikt. Ik heb de afbeelding ingekleurd met mijn Polychromos potloden en de zwarte glaze pen. 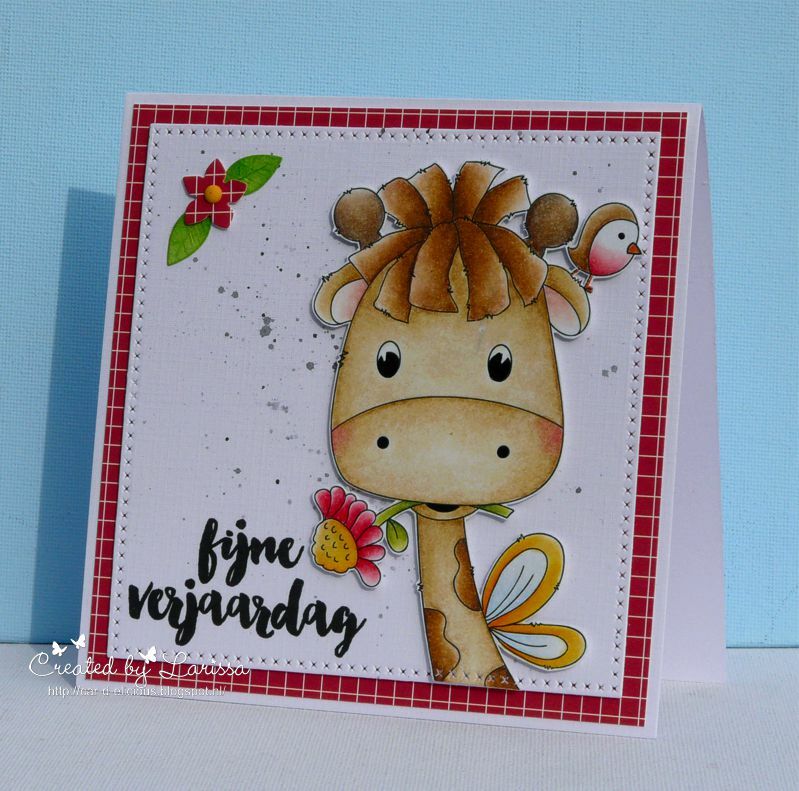 Om het kaartje extra feestelijk te maken heb ik de zebra niet in zijn traditionele kleuren ingekleurd, maar juist in allerlei vrolijke kleurtjes. Ik heb de afbeelding uitgestanst met de Crea-nest-lies XXL 44 en 52 van Crealies en ik heb deze dies ook gebruikt om een grote en hele kleine rechthoek uit zwart karton te stansen. Op de kleine rechthoek heb ik een tekst van de stempelset Simply said clear stamps van Uniko gestempeld met versamark inkt en daarna heb ik deze geëmbost met witte embossingpoeder. Ik heb alles samen op een kraft kaart geplakt. 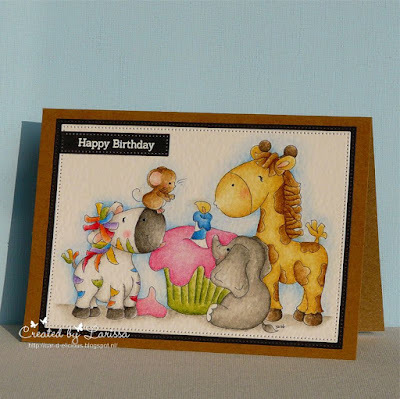 Hello, today a new challenge has started on the Di's digi designs challenge blog and this time our challenge is birthdays. Not a really difficult challenge. I am a bit late with my card. I finished my card last weekend, but then I totally forgot to take a picture of it before today. But I was able to take one now, so here is my post. For this challenge I made a card with the image Tasty cupcake from Di's digi stamps. I have coloured the image with my Polychromos pencils and the black glaze pen. To make the card extra festive I decided to colour the zebra not in its usual colours but instead I used all kinds of happy colours. I have die-cut the image with the Crea-nest-lies XXL 44 and 52 from Crealies. I used the same dies to colour a large and really tiny rectangle from black cardstock. On the little rectangle I stamped a sentiment from the set Simply said clear stamps from Uniko with versamark ink and then I embossed it with white embossingpowder. I adhered everything on a kraft card. 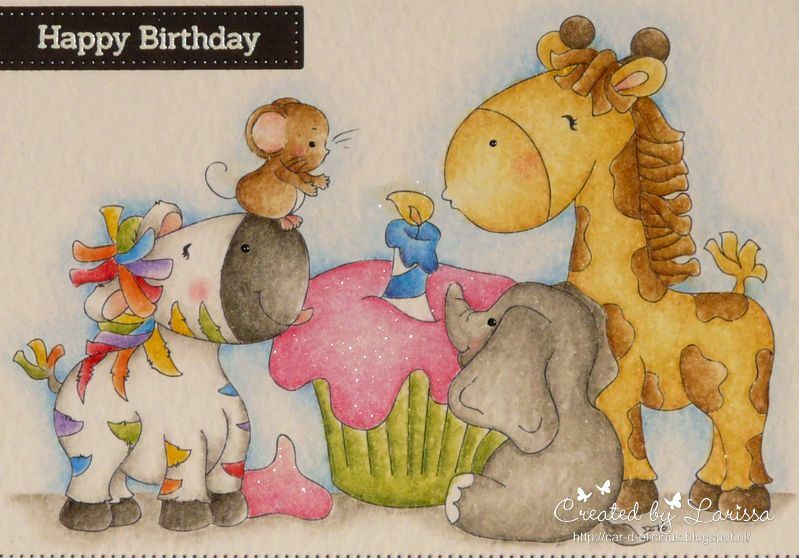 What a cute image and beautifully coloured. Thank you for sharing with us at Crafting From the Heart this week. Your colouring makes these sweet critters even cuter! Thanks for joining us at Seize the Birthday! This is so adorable!! Your coloring is amazing and I love how you added a little fun to the zebra! Thank you for joining us at Digi choosday. Een superleuke kaart met een hele lieve afbeelding. In line with new European Data Protection Laws (GDPR) by commenting you know that your name & comment are visible to all who visit this blog and thereby consent to the use of your personal informations for this specific purpose. choccy egg box decorating fun!! 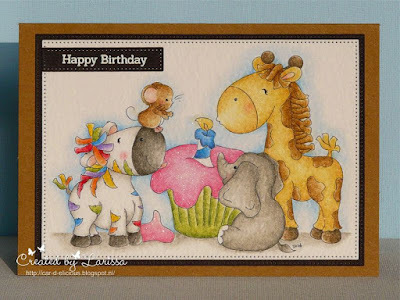 Di's digi stamps - Hello sweet friend! Di's digi stamps - I woof u! Gerda Steiner designs - Stay pawsitive!